National reports submitted in the framework of the Basel Convention suggest that nearly 180 million tonnes of hazardous and household wastes are generated annually around the world. According to the same reports, at least 9.3 million tonnes of these wastes move from country to country each year, and this waste is presumably received as a welcome source of business. This leaves some 170 millions tonnes of hazardous and household wastes that are assumed to be disposed of nationally in an environmentally sound manner. But is this the case? Many countries complain that they are receiving shipments which they never agreed to or that they are unable to properly dispose of. From Brazil to Singapore, from Belgium to Ghana, or from Canada to Russia, it would be challenging to find a single country that has never suffered a case of illegal traffic of waste. Preventing, detecting and acting against the illegal transboundary movements of hazardous and other wastes (“illegal traffic”) is a crucial element in the global waste challenge. 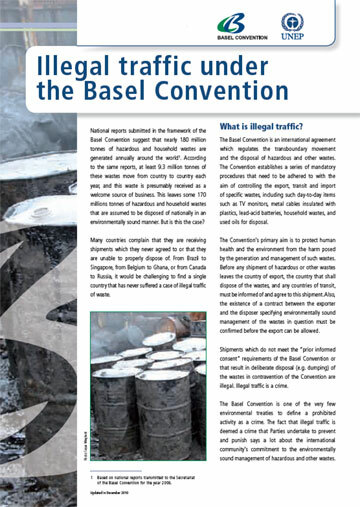 The Basel Convention is one of the very few environmental treaties to define a prohibited activity as “criminal”. The fact that illegal traffic is deemed a crime that Parties undertake to prevent and punish says a lot about the international community’s commitment to the environmentally sound management of hazardous and other wastes. Illegal traffic of hazardous waste is unfortunately still very common in all corners of the world. that results in deliberate disposal (eg. dumping) of hazardous wastes in contravention of the Convention and of general principles of international law. The Secretariat undertakes technical assistance activities as mandated by the Conference of the Parties. Such activities may be directed at any stakeholder involved in the transboundary movement of hazardous wastes or other wastes. for instance Competent Authorities, Customs, police, prosecutors and judges.